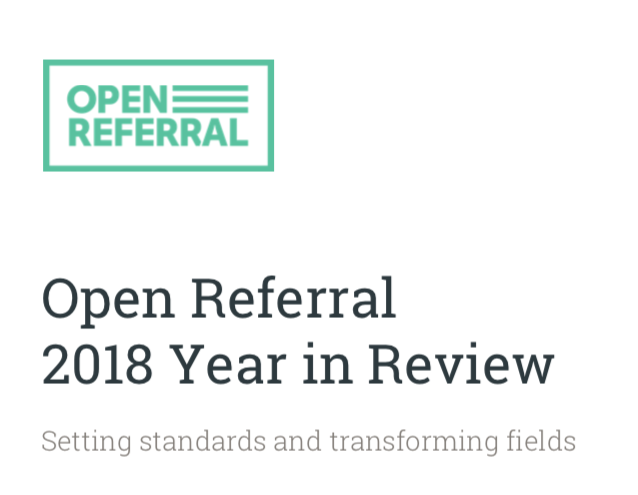 This was the Open Referral Initiative’s fifth year – and in several ways, 2018 stands as a culmination of all the work we’ve done to date. Open Referral’s resource directory data exchange protocols are now being used by community organizations, technology vendors, governments and philanthropies, each working in different ways to improve the accessibility and reliability of directory information about health, human, and social services – and the sustainability of the resource referral programs that use this information to help people find help. By the end of the year, the Alliance of Information and Referral Systems made this movement official by formally endorsing Open Referral’s protocols as industry standards. With this breakthrough, our saga begins an exciting new chapter. As these once-experimental methods mature into recognized best practices, we will have more opportunities in 2019 and beyond to make it ever easier to share, find, and use information about the resources available to people in need. For now, let’s take a moment to celebrate all that we’ve accomplished so far. The 2018 Year in Review includes an overview of our progress, a summary of our strategy from here – including a specific set of sustainability models that are currently being tested by a range of Open Referral pilot projects. Read through the 2018 Year in Review here; you can also download it as a PDF here. Special thanks to Allen Gunn of Aspiration and Christine Prefontaine of Loup.Design for their guidance on this report and across all five of Open Referral’s years. Blog airs, strategic framework, year in review. permalink.